OK! Time to stop dreaming about weekend plans and find out what is going on! FW-1 at fw6057: Access denied. Requests were being redirected to our edge firewall. The network used two Forefront TMG in Network Load Balanced (NLB) configuration and all browsers received proxy details via WPAD.DAT script, delivered by GPO from our Active Directory servers. When setting the web proxy details manually in Internet Explorer using the IP and port of the Forefront TMG proxy server, Internet access was restored! This narrowed the problem down to an issue with the WPAD.DAT script. Success! I could download script. I tried manually setting one of the workstations to download the script using port 8080, and it was able to access the internet again! OK my friends! I’ve found what was wrong! The Forefront TMG Server was refusing requests to the WPAD.dat script on port 80. When checking this option again, all users got their Internet access back! 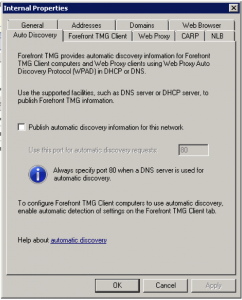 The ‘Publish automatic discovery information for this network’ option in Forefront TMG allows access to the Web Proxy Automatic Discovery (WPAD) protocol. All you need to do is configure a host record in DNS called WPAD that resolves to the IP address of your Forefront TMG’s internal network interface. The WPAD method can pose potential security issues, so Microsoft added WPAD to the default Global Query Block List in Windows Server 2008. This means that the DNS service will not respond to WPAD queries by default. 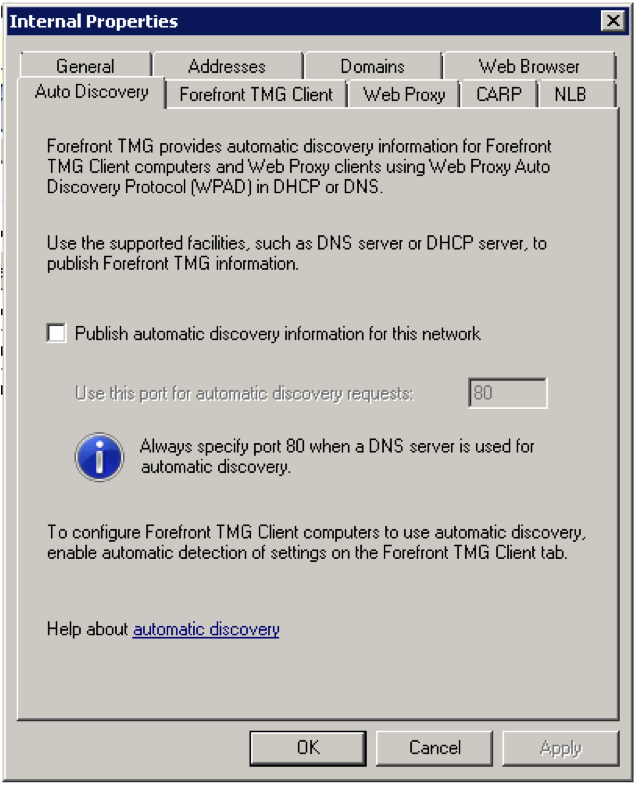 It is possible to turn this method on by following some steps that my friend Richard Hicks describes in his post: DNS Security Enhancements and Proxy Auto Discovery. Using an address like the one above won’t impact users if someone unchecks the Automatic Discovery publishing option. You also need to be sure the script address on Forefront TMG matches what you have specified in Active Directory GPO.